Need quality and unique giveaway ideas that can bring smiles to all ages? Why not opt for giveaways aimed at kids? You could distribute them at schools or shopping centers to spread the word about your brand. You could also distribute them among employees and customers, they will gladly take these giveaways home to their kids! Children love to play, explore, and learn something new! With that said, there are a lot of sophisticated and desirable gifts available in stores to satisfy their high levels of curiosity and excitement. Keeping this in mind, Promo Direct’s inventory features some of the finest kids-themed giveaways available online. Marketers can rely on our fun giveaways to win the trust and attention of a young target audience. • Toys: Custom toys like fidget spinners, soft toys, balloons, frisbees, and bouncy balls are cost-effective yet reliable promotional gift items. Children will love these compact toys, carrying them around wherever they go. The invaluable visibility gained through these toys will serve your brand well. Recommended Buys: Light Up Fidget Spinner – Full Color, 6″ Plush Lion with Shirt, and 9-1/4″ Flyer – Full Color. • Bags: Kids and bags are inseparable! We have a variety of bags that can be used at the school, gym or camp. Our bags are compact yet spacious while offering quality imprint area for your brand. 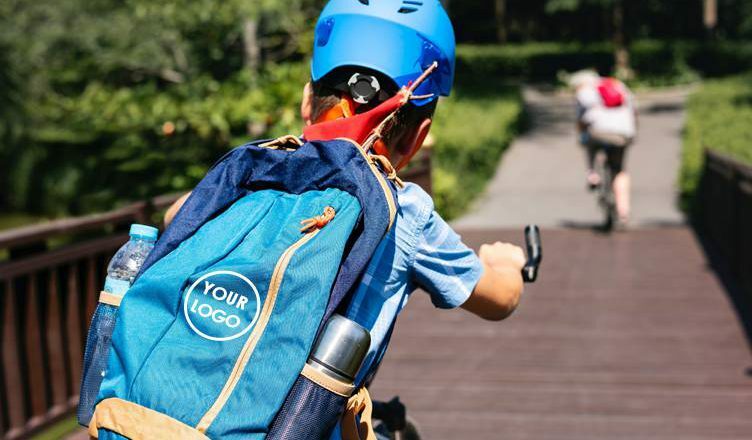 Kids instantly transform into brand ambassadors when they carry these bags around town! Recommended Buys: Drawstring Sport Pack, Scout String Backpack – Full Color, and Personal Lunch Bag. • School Supplies: Kids love activity books that feature a lot of coloring tasks and puzzles. These books help them stay engaged at home. Notebooks, pens, pencils, and crayons are giveaways that can be put to use at home or school. You could also opt for Back-to-School kits for your next campaign. Recommended Buys: Honor Roll School Kit, I Love My World Coloring Book and Mood Stick Pencils. • Apparel: You could opt for trendy apparel that will win hearts in no time! We have a range of tees, sweatshirts, jackets, and pullovers that offer a comfortable fit for kids of all ages. Made of long-lasting fabric, our range of apparel will provide your brand with a big boost around town! Recommended Buys: Port & Company® – Youth Tie-Dye Tee, Sport-Tek® Youth Colorblock Raglan Jacket, and Sport-Tek® Youth V-Neck Raglan Wind Shirt. Keep an eye for events that are coming up at local schools in your area. Step up and offer to provide imprinted goodies from the ones mentioned above to make a branding impact. Get in touch with our team if you are looking for the right giveaway or marketing campaign idea targeted at kids. We will gladly be of help!